We awoke that morning to flat light with low clouds covering the mountaintops. This equates to a high probability of not being able to heli ski. Good light and visibility are required for a helicopter pilot to fly safely in mountainous conditions in winter. But our lead guide, Matt Edwards, announced our imminent departure for the helicopter Hanger. The excitement began to build as we grabbed all our gear and walked to the hanger. It was hard for the guests to focus on our safety briefing, as they were so excited for the possibility of heading out to ski. We ran through the avalanche briefing and the helicopter briefing, and divided into two ski groups for the day. Matt took the first group, loaded into the helicopter, and took off to the North. Being the second guide, I watched in anticipation as the helicopter took off and flew towards the North in hopes of finding blue skies and good light. Our second group waited eagerly for quite some time before we heard the distant hum of our A-star coming from the North. We were excited to discover that there were blue skis far to the North, this is where we were headed! The flight northward started with white light and low hanging cloud, forcing us to fly fairly low over the white landscape. Below us we could see dog sled teams pulling their East Greenlandic hunters through the winter conditions, heading for their favourite hunting grounds. East Greenlandic culture is still solidly grounded in the hunting tradition, and dog sled teams, snowmobiles and boats make this possible in today’s mix of traditional culture and modern conveniences. We soon came to the promised blue skies. What greeted our eyes was the most incredible, extensive helicopter accessed terrain any of us had ever seen. 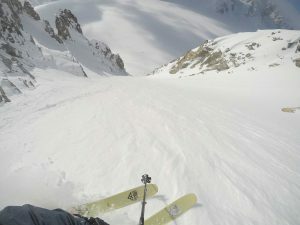 The jagged rocky peaks gave way to perfect pitched snow covered ski runs. Interspersed with glaciers, crevasses, moraines and rock features. Each ski run promised 360 degree views from the top, incredible snow to ski, and helicopter pickup on the shores of the ocean. Our pilot expertly flew us to the top of the first run and with practiced precision, he dropped us off. We watched as he took an extreme nose dive down the slope to pick up the first group. We whooped and hollered in excitement as we took in the views around us. To the south we could see range after range of jagged rocky peaks. To the North was Sirmillik Fiord with hundreds of pristine white icebergs lazily floating in the black, glass calms waters of the Fiord. Further north we could see the Greenlandic Ice cap, for as far as the eye could see stretching for thousands of kilometres. After Clicking into our skis and snapping a few photos at the peak, we began our descent. We pushed off the landing pad into perfect powder skiing. We negotiated a steep lip, and skied into a big wide open bowl. Still skiing perfect powder, we threaded the needle between two open crevasses and came to rest mid glacier. Here the snow abruptly changed to spring like conditions, as we were only half way down the 1500m descent. We negotiated our way around another crevasse, and were drawn into a beautiful little gulley that acted like a natural half pipe. Like kids in a playground, we each took advantage of this half pipe feature, and more whoops and hollers could be heard! We came out of the half pipe and could see the helicopter at the bottom of the run, looking like a tiny toy in a vast landscape. Despite the fact that we could see the helicopter, our first descent was still not finished! We dashed off for the duration of the ski lines, using the features of the mountain to carve big turns until the meadow where our “chariot” was awaiting. The pleasure of heli skiing in an Astar means many things. Small groups, the helicopter is turned off at the bottom of the run, the ability to land in places where larger helicopter can’t access. 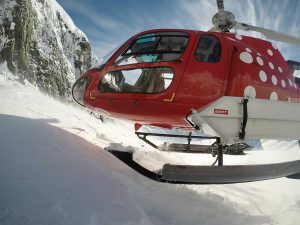 All of these features allowed us to revel in each run of each day of our heli ski trip. We were better able to enjoy all the views and each other’s company as there was never any pressure from other groups. As our ski day continued, we were in constant awe at the beauty around us. 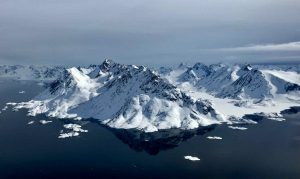 Our lead guide, Matt Edwards, who has led heli ski groups in many places, believes that East Greenland offers the most incredible views of any Heli skiing in the world. We easily agreed with him as the views were constantly changing and constantly amazing. Some of the ski runs brought us past turquoise colored seracs and crevasses that made us feel ver small and insignificant on the massive glaciers. Setting down at the top of different peaks for each run, we got a sense of the massive scale of East Greenland. We could heli ski here for weeks and never ski the same run twice. We savoured every turn and view on the last run of that first day. We skied until 7pm that evening. We marvelled at the sunset over the Greenlandic Ice Cap which began to take on the colours of the sun set. Soon the hundreds of icebergs in the Fiord began to glow pink and orange as well. We skied right to the ocean edge, and basked in the beauty and grandeur of our first day Helicopter Skiing in East Greenland. With our legs tired from a full day of skiing, and our memory banks full of all the beautiful scenes from the day, we slowly piled back into our Helicopter Chariot and began our flight back admits the pinks and oranges of the setting sun. The Angmassalik region is the most remote and wildest region in Greenland. Mountains here tower over the ice filled fiord creating a spectacle like nowhere else. Most runs start at around 1200m and finish at the ocean shore. The terrain is absolutely world class and the scenery is nothing short of spectacular.